Christmas is all about miracles, family, and celebration. I love to see Christmas light decoration and Christmas village displays around the city. I have already published Christmas lights around Milwaukee in which I shared some of the huge Christmas Light display. The Milwaukee downtown itself has many places to see decorated Christmas trees. Wisconsin winter is cold, breezy and snowy. I saw that we had snow forecast on Sunday and temperature get freezing after that. I decided to take a look at downtown and see holiday spirit before it gets cold. We went to the Historic third ward which filled with full of holiday spirit. I didn’t know there was Gingerbread house display in the Milwaukee Public Market. It just happened that we were roaming on the street and we decided to have a coffee, So we entered into the Market, bought a coffee and decided to sit there for a while. 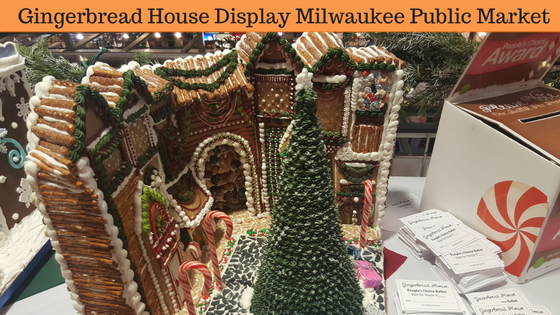 I didn’t know there was Gingerbread house display in the Milwaukee Public Market. It just happened that we were roaming on the street and we decided to have a coffee, So we entered into the Market, bought a coffee and decided to sit there for a while. When we were climbing the stairs, I was wondering why it’s so crowded? I was amazed seeing a display of so many Gingerbread houses once we get upstairs. There was more than 30 gingerbread house on display. All the houses made by Milwaukee Area Technical College students. This display will run through December 15. All the designs made by students only. I can’t believe how expert those students in baking. This display includes silent Auction as well. You can bid on your favorite house. if you win, you can take it to the home. The Money from auctions will be used to offer scholarships to students in baking programs through the MATC Foundation. Even we the visitors can also vote for “people’s Choice” Scholarship winner. The market is open weekdays from 10 a.m. to 8 p.m.; Saturdays from 8 a.m. to 7 p.m.; and Sundays from 10 a.m. to 6 p.m.